Cryptosporidium and other chlorine resistant micro-organisms are a problem for potable water supply companies throughout the world. Numerous problems have been reported with the Cryptosporidium outbreak in Milwaukee (USA) which occurred in April 1993 as most notorious example. Cryptosporidium and Giardia form cysts which are very resistant to commonly used disinfection methods, e.g. a UV dose of 100 mJ/cm2 will only achieve a 90% kill rate. Note that this dose is about twice the dose normally being used for drinking water disinfecting. The cysts are quite large, relative to other microorganisms, the Cryptosporidium oocysts measuring roughly 2 to 10 micrometers in diameter. This is an advantage from a water treatment point of view as they should be easy to remove with an absolute filter. NORIT Membrane Technology's ultrafiltration membrane provides this absolute filter. NORIT historically has been a company deeply involved in water treatment through its activated carbon division. NORIT has seen the importance of additional water treatment needed by its customers. Therefore NORIT started four years ago to form a separate division, NORIT Process Technology. This division consists of several companies active in water treatment and in engineering and manufacturing of process equipment. ♦ Breweries. Microfiltration shows a promise in replacing Diatomaceous Earth precoat filters for yeast removal. ultrafiltration is the key for low cost and reliable production of process and cooling water. ♦ Pre-treatment for seawater desalination. Conventional pre-treatment can often not remove contaminants, such as silt and algae, which interfere with reverse osmosis membrane operation. Ultrafiltration can achieve this in a single step, without the need for dosing chemicals, such as chlorine or flocculants. ♦ Potable water production. Increased awareness of water borne diseases has shown that conventional treatment has its drawbacks. Ultrafiltration will provide an absolute barrier. Four years ago NORIT Membrane Technology became the first company within the Process Technology division. Since then a membrane manufacturing facility has been added to this division as well. This gives NORIT Membrane Technology the opportunity for in house development of membranes as well as applications. Yorkshire Water Services, one of the large private water companies in England, has a potential problem with the ground water sources used to supply the city of Hull and the surrounding areas. For the vast majority of time the water is of excellent quality but there are occasional spikes of turbidity after heavy rainfall. Although Cryptosporidium has not been detected the sources are potentially at risk. Pilot plant work was carried out which indicated that ultrafiltration would be a cost effective method of treating the water to provide the required barrier. Yorkshire Water decided to proceed with a scheme to treat the four affected sources at a central 90 Ml/day ultrafiltration plant. Earth Tech Engineering was appointed as the main contractor to refurbish the borehole sources and construct the new works. Earth Tech, part of the TYCO group of companies, subsequently went out to competitive tender for a membrane plant, capable of achieving a minimum of 4 log removal (99.99%) of Cryptosporidium sized particles. NORIT Membrane Technology was awarded the subcontract to design and supply the membrane plant. ♦ Reliability. This is of foremost importance, as the installation will be providing drinking water to a large area. Plant down time has to be avoided; therefore NORIT Membrane Technology used a design which has no single point of failure. ♦ Flexibility. The flow through the plant will vary from 30 to 90 Ml/day. 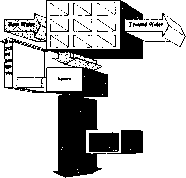 The plant uses a modular design, which enables part of the plant to be switched off in the case of low demand. Future expansion up to 99 MLD can be realised by adding modules to the plant. ♦ Quality control. The water produced by the plant has to be of a proven quality. On line monitoring and long term logging of the water quality will ensure a reliable plant operation and supply. ♦ Ease of operation. Unlike conventional water treatment plants, an ultrafiltration system can not be operated manually. All flows and timers have to be tightly controlled; therefore foil automatic operation is implemented. ♦ Minimisation of the environmental impact. Production of wastewater, energy consumption and chemicals usage has to be minimised. 1. 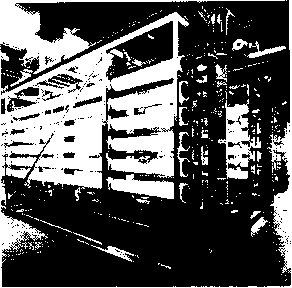 The ultrafiltration plant consists of eleven identical modular membrane racks. Each membrane rack can hold up to 3360 m2 of membrane area. 2. During normal operation up to nine membrane racks will be used to treat raw water. The capacity can be varied either by controlling the flow to the individual racks or by switching racks offline. These nine racks in production are called the primary ultrafiltration system. 3. The above racks will generate approximately 5% wastewater. One rack is used as a secondary ultrafiltration system to reduce this volume. The filtrate from this rack will be returned upstream of the primary ultrafiltration, see figure 1. 4. The eleventh membrane rack is a common spare for both the primary and the secondary ultrafiltration systems. 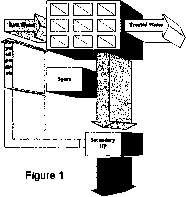 If one of the primary membrane racks is out of service the spare will be used as primary ultrafiltration system (figure 2), if the secondary ultrafiltration is out of service the spare will be used as secondary ultrafiltration (figure 3). 5. Four independent PLC's will control up to three membrane racks each. This means no single point of failure and allows for future expansion by adding a further membrane rack. 6. The PLC's will control normal operation of the ultrafiltration racks. 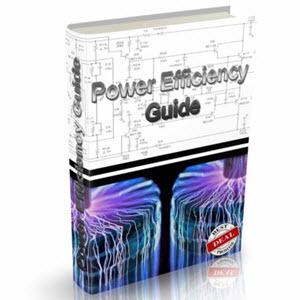 A Supervisory Data Acquisition and Control System (SCADA) is used as operator interface and for telemetry. In addition to the SCADA system each PLC will be equipped with a local control panel. This control panel will be used for local read out of the instrumentation and for operation in case the SCADA system is out of service. The primary ultrafiltration system uses membranes with a pore size of 150,000 Dalton. This is roughly equivalent to 0.05 micrometer, one hundred times smaller than the size of the Cryptosporidium oocyst. The membrane will not only remove Cryptosporidium but also viruses. The membranes are formed in the shape of hollow fibres, with an internal diameter of 0.8 millimetres. Ten thousand membranes are bundles in a membrane module; this module holds 35 m2 of membrane area. The module has a diameter of 8 inch and a length of 60 inch, identical to a RO Magnum module. Four modules will be fitted in one pressure vessel 6 meters long. Each of the nine primary membrane racks holds twenty-four pressure vessels in four stacks of six pressure vessels (figure 4). Membrane cleaning will be done either by a flush with clean water (backwash) or by a flush with low concentrations of chemicals (Chemically Enhanced Backwash). A Chemically Enhanced Backwash does not require circulation of cleaning chemicals or elevated temperatures, but is rather performed by a simple wash followed by an extended soak time. This minimises chemical usage and energy consumption. Three Cleaning in Place units will be used: each unit will clean three membrane racks. The secondary ultrafiltration plant uses the same membranes as the primary ultrafiltration plant. The rack is identical to the primary ultrafiltration racks. The concentrate from the primary ultrafiltration is buffered in a small tank being fed to the secondary system. This can be done in two ways: either start/stop operation on high and low level in the tank, or by controlling the flow and matching secondary ultrafiltration capacity to waste production of the primary plant. The secondary ultrafiltration will be cleaned in the same way as the primary ultrafiltration. The frequency of cleaning and the concentration of the chemicals to be used can be set independent of the setting of the primary ultrafiltration. The CEP unit is common for the secondary ultrafiltration and for the spare membrane rack. The washwater generated by cleaning the secondary ultrafiltration is held in a buffertank where it is neutralised before discharge to sewer. The maximum discharge rate is 15 litres per second. Both the primary and the secondary ultrafiltration system use NORIT's SIM®-test. This test (Spiked Integrity Monitoring) is a new design specifically developed for membrane integrity control at potable water plants. For potable water uses, the feed water is often of high quality and the purpose of the membrane is to remove micro-organisms. The customer demands a high degree of membrane integrity and defects must be detected quickly, preferably by an on line test, which can be carried out at frequent intervals. Conventional water quality instruments, such as turbidity monitors, are not suitable for this. Defects would not be detected unless there were multiple failures. Moreover this would not become apparent until turbidity was present in the raw water. ♦ The ultrafiltration process has to be interrupted. This test can not be done on line and thus lowers net plant capacity. ♦ This test is very sensitive to outside disturbances: even minor outside leaks like e.g. incorrectly positioned valve seats will give a false impression. ♦ There is no direct relationship between the readings from the test and the actual removal rate for micro-organisms by the membranes. ♦ The maximum membrane area to be simultaneously monitored is limited. This effect is caused by the diffusive airflow through the pores of the membranes. NORIT Membrane Technology has invented a new integrity monitoring system that overcomes all above problems: it is called Spiked Integrity Monitoring. The SIM®-test is based on the principle that the ultrafiltration membrane is challenged with a known dose of Cryptosporidium sized particles and the permeate quality is on line monitored. The particles to be used for spiking the feed water are made of powdered activated carbon. This activated carbon dust is harmless and has DWI approval. If a known, high dose of particles is fed to the membranes, the amount of particles in the permeate can be used for calculating the log removal for Cryptosporidium sized particles. The particles present in the feed water give a negligible contribution to the overall particle counts and to the log removal readings of the SIM®-test. ♦ The test can be done on line. No production losses will occur. The test can be performed as often as one wishes. ♦ The actual log removal rate will be recorded and can be used for future references. It will be possible to plan maintenance in advance, based on anticipated removal rates. ♦ The SIM*-test is independent of membrane area to be monitored. The activated carbon will only pass through defects, no diffusion will occur. For the Yorkshire Water Keldgate plant NORIT Membrane Technology will use four independent SlM®-systems. As described above the ultrafiltration plant consists of eleven membrane racks of up to twenty-four pressure vessels each. Each one of these membrane racks has its own feed pump and its own prefilter. The prefilter is used as a safety filter to protect the down stream membranes from coarse particles. The membrane racks (figure 4) are mounted on stainless steel frames. These will be pre-assembled and tested prior to shipment. The Keldgate site consists of three separate buildings: the main building, the chemicals building and the control building. The control building will house the SCADA system. All local automation equipment (PLC's) will be located on the membrane racks in the main building. The main building is designed with two floors: the basement and the ground floor. The basement holds the ancillary equipment, such as the pumps, the pre-filters and the buffertanks. 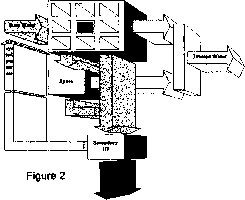 The membrane racks are positioned on the ground floor and are connected through the floor to the ancillary equipment (figure 5).